The shaft of the paddle is the “foundation” and the sub-assembly that the blade and the grip will be glued to. Proper laminated shaft design considers several different points; species of wood, shaft flex, sectional shape, and length are the main points to start the process. Overall blade size will come into play as well, so you might look at the blade size on the paddle you are currently paddling and start planning for the material you need. The materials you choose for your shaft will impact both weight and flex. Some flex is good but sometimes too soft a flex doesn’t work out for the better, so designing a lamination that is light, strong and with just enough flex is critical objective for a shaft that can be used comfortably. Determining overall finished paddle length, and assembling the materials are the first steps in the process. The materials you choose for the shaft should be 2” longer in rough form than the finished length of the paddle you will be making. The paddle will be assembled in rough form then cut to length after all of the sub-assemblies have been assembled. The best paddle shafts I have made are a combination of several different woods. Some wood species are chosen because they are light and strong, some woods are chosen because they will flex and are strong, and some woods are chosen because they are beautiful, not too heavy, and have some structural capacity. The right flex for me, which is fairly soft, is a combination of vertical grain douglas fir, salvaged old growth redwood and paulownia with the center being 1/16” redwood, then two 3/16” laminations outside that, then two paulownia laminations outside that, then finally redwood strips on the outside. I make “rough” lamination approximately 1½” x 1½ which gives me plenty of material to shape the saft from. See photo below of the setup for gluing up a straight shaft. The gluing jig I use is a 1 ½” x 1 ½“ piece of lumber that is screwed to a flat strong back. It’s critical that the strong back be flat. If it isn’t you will laminate a curve into your shaft! Again, the rough shaft length should be two inches longer than the overall finished length of your paddle. Careful consideration must be given to the type of adhesive that you use to glue the shaft laminations together. I’ve experimented with most types of “waterproof glues” and have found that I get the best results from epoxy. Any glue, such as the aliphatic resin type have a moisture content that transfers to the wood during the curing process. The outcome has been shafts that didn’t end up straight without a way to fix the problem after the shaft comes out of the clamps. Even the foaming polyurethane glue guideline suggests best adhesive performance if the wood is dampened slightly prior to spreading the adhesive, so for me polyurethane is a “no go” for paddle shafts. Proper epoxy technique with pre-saturation of the glue surfaces and correct amounts and types of thickening agents will produce a shaft that comes out as straight as the jig set up. In the photo below you will see the basic set up for gluing together a paddle shaft. I attach a 2″ x 2″ piece of wood to a flat table. The 2″x 2″ piece of wood is the jig and another 2″ x 2″ is used as the clamping caul with the strips that make up the paddle shaft being wrapped with waxed paper so the shaft strips don’t stick to the jig or caul. 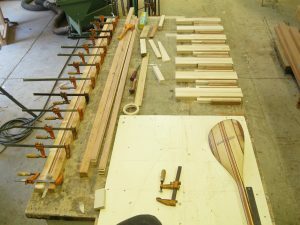 You can also see in the photo below that I have the paddle blade parts organized and laid out and ready for gluing to the paddle shaft.